Sample pad – an adsorbent pad onto which the test sample is applied. 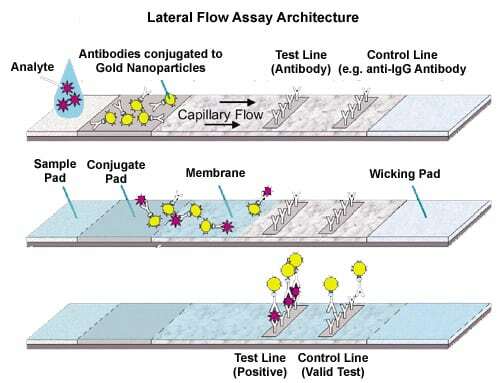 Cytodiagnostics manufactures a full product line of gold nanoparticles (colloidal gold) for use in a variety of lateral flow assays. Our diverse product line of different type of nanoparticles offers you products with a narrow size distribution (CV of less than 12%), exceptional adsorption and conjugation properties and with greater than 95% spherical particles. In addition, their batch to batch variability is extremely low (+/- 2nm), which assures that you their customer will always end up with a product within the specified size range that you ordered. The high shape uniformity of their colloidal gold will minimize the variability within your assay by e.g. allowing control over the available surface area while absorbing or covalently conjugating proteins to their gold nanoparticles. It will also ensure a more uniform flow rate across your membrane for improved reproducibility and overall results.